FYI: While this Brit worship leader’s name and face probably still isn’t as familiar as the high-profile artists (Michael W. Smith, Rebecca St. James, Kutless, Newsboys and countless others) who’ve covered his worship songs over the years, Matt Redman has written many of the songs that are sung in Sunday morning church services around the globe. 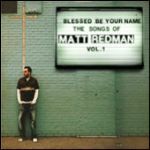 In fact, 7 of the 12 tracks found on Blessed Be Your Name: The Songs of Matt Redman Vol. 1 can be found in the top 200 on CCLI’s chart, the official service that tracks the worldwide popularity of modern worship songs in churches. The Bottom Line: For those who’ve never been able to attend a Soul Survivor service in jolly ol’ England or a Passion worship event in the States, never fear. Now for the first time on a live recording format, Matt Redman’s songs have been compiled onto one definitive collection that should satiate the appetites of longtime fans, while providing a great point of reference for those who aren’t familiar with the songwriter behind the familiar praise choruses of past and present. —Christa Farris Listen to samples from this album or buy it from Songs4Worship.com!